A hearty sauce invented by a French chef in 19th-century Russia with a sophisticated modern twist. Traditionally served with strips of beef and matchstick potatoes, it’s also delicious with pork or chicken. Heat 1-2 tablespoons of oil and stir fry 500g of sliced beef or chicken for 2-3 minutes. Also add finely sliced mushrooms if you desire. 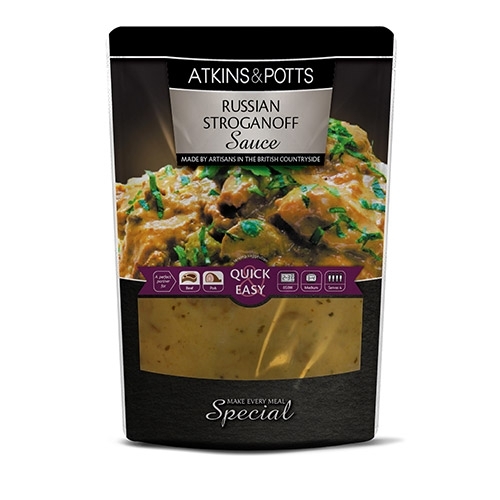 Stir in Atkins and Potts ready made sauce and simmer until cooked. Either serve with it's traditional partner of matchstick thin cut chips or spoon on to a bed of rice or noodles. Sprinkle with a little extra paprika or parsley.